NEW! Samsung Flat-panel TVs with 30 channels of HD programming. Easy-access Plug-and-Play feature makes it simple to connect electronics. The La Quinta Inn Dallas - Uptown is located by the popular Uptown/West Village area and less than three miles north of downtown Dallas and 5 miles East of Love Field Airport. Conveniently located within walking distance to restaurants and boutique shopping, it is the ideal location for both business and pleasure. From our location along Central Expressway, just a short trip puts you at the Dallas Convention Center, Market Center & World Trade Center, Baylor Medical Center, Southern Methodist University, The Cotton Bowl, American Airlines Center, Dallas Arts District, The Six Floor Museum and local entertainment districts including Dallas Uptown, Victory Plaza, West End, McKinney Avenue, Lower Greenville and Deep Ellum. 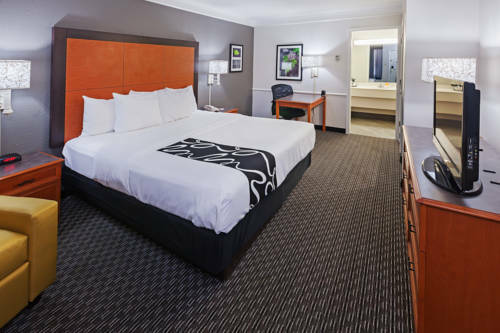 Comfortable rooms and a dedicated staff ensure a pleasurable stay at the La Quinta Inn Dallas - Uptown. If you are visiting for business, ask for a king room, featuring enhanced workspace with free wireless high-speed internet. Enjoy our refreshing Swimming Pool, free Bright Side Breakfast, Free Parking, free Showtime, and free local calls. Towering fiberglass man decked out in ceremonial headdress, war-paint, and a short-sleeved golf shirt. Monument topped by a small biplane sculpture marks the spot where an early 20th century pop superstar fell from the sky. The grave plot of Davy Crockett's second wife has been declared an official Texas park.